After serving up a Swoosh-laden Air Force 1 Mid , Nike opts for another over-the-top take on its classic basketball sneaker. This time, the Air Force 1 '07 will soon arrive in two distinct colorways, loaded with star-studded detailing. Offered in contrasting "Oil Grey/Olive Grey/White" and "Triple White," the sneakers boast gold and silver stars, respectively, across the forefoot, midfoot and heel panels, with the toebox and Swoosh left undisturbed. Shiny gold tongue branding and lacelocks complete the opulent design, with premium grain leather completing the premium construction. Nike 's second Air VaporMax model welcomes yet another color choice for the fall. Amidst reworked iterations such as the VaporMax Run Utility , Air VaporMax Plus and many others, the Air VaporMax 2.0 will soon release in "Vast Grey/Metallic Gold/Pure Platinum/Dark Grey-White." Its lightweight Flyknit upper shares light grey with its Swoosh stamps and tongue branding in metallic gold. 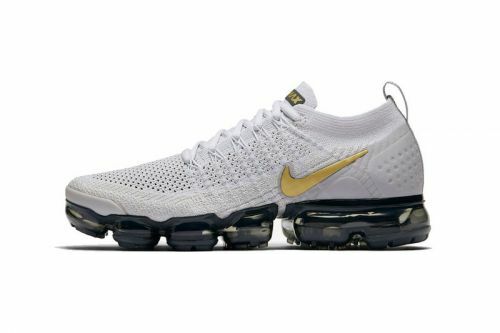 A black translucent VaporMax unit contrast the upper to finish off the Olympic-like colorway.